Nightcrawlers are a kind of earthworm. From commercial point of view nightcrawlers are primarily used as fishing bait. They are generally referred to as either ‘Canadian’ or ‘European’ also infrequently ‘Belgian’. Canadian nightcrawlers are larger than the European ones, having a length measuring abuot 14 inches when elongated. 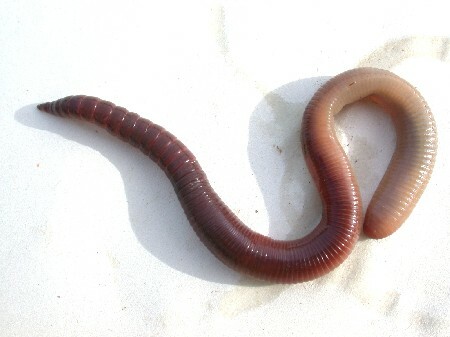 Fishermen prefer the Canadian worm because of its relatively huge size. It can be easily sheeted over a fish hook piercing through it, and remains alive for about 5 minutes while hanged inside of water. Canadian nightcrawlers are usually used for hooking smallmouth bass, carp, trout, catfish, largemouth bass, sunfish, walleye, and other freshwater fish. A great set back with the Canadian nightcrawlers is that they can not withstand temperatures above 18.3 °C. Consequently, bait shops need to install regrigerators to prevent them from dehydration or eventual expiry and caution will have to be exercised to ensure that the worms are never let to expose to hot sun out there while you fish by the side. The worms are in fact collected by hunters / pickers wearing headlamp who have to probe throughout freshly cut yards, golf courses, fields, and cow pastures even. Following a decent precipitation, the worms come out of the ground only at night or when the soil is extensively damp. The ideal temperature range for hunting nightcrawlers is between 10 to 26.7 °C. While the ideal time for worm catching is when light drizzling is going on, and the temperature is around 65 °F, and there is no thunder or noisy around. There are a number of theories related to the peculiar behavior of earthworms in a rain storm. One of the theories states that When a rainstorm is in progress, the supply of oxygen underground decreases at a rapid pace, making the earthworms to surface to breathe as the ground becomes more and more saturated. This, however, is not the only accepted theory. Another related theory propounds that when the weatherly conditions as stated above are met; this is the high time for worms to move about. Clouds for worms are much feasible as they reduce the intensity of the sun, worms therefore find it convenient to crawl about and since the soil is also soft, it is pretty easier for them to drill through forming their burrow. A few scientists are of the opinion that during the rain storms earthworms try to form new colonies in utterly different locations; this arrangement is vital for their survival esp. in case a location becomes overpopulated. Moreover, it is also risk free for the worms to travel during such weather as most of the predators won’t venture out there. According to a supplementary theory, which is not very much popular, states that rain water increases the acidity of the land, which causes the nightcrawlers to get out of their holes to avoid burning. Presently, there is no evidence available to prove this supposition, as soil tested has shown slight variation in pH.